snips snippets: Wip Wednesday... and my ridiculously long Q3 FAL list. Wip Wednesday... and my ridiculously long Q3 FAL list. So lets start with the list. I warn you though, there's going to be a lot of pictures. And i would also ask that you refrain from laughing until after you leave my blog. I fully understand that i'm delusional and possibly in need of professional help. You may want to get a drink, or a snack, or something. 1. My Mom's RtT quilt. This. Has. To. Get. Done. Now. But the thought of sitting under two layers of batting and a flannel backing, in my un-airconditioned home, with the heat averaging about 30 degrees and the humidity at 60%, blarg. 2. Max's +'s quilt. DONE!!! Rolling this one over from Q2 but in all honesty, Max has been sleeping in nothing but his diaper lately, does he really need a quilt? 3. The Washi Swoon i started... last summer? Six blocks down and three to go! I do however have the fabric cut out for them, so this will be a breeze, right? Keeping things easy i figured while i was stitching together the last of my washi swoons i might as well take care of the Baby Swoon i started... also last summer? 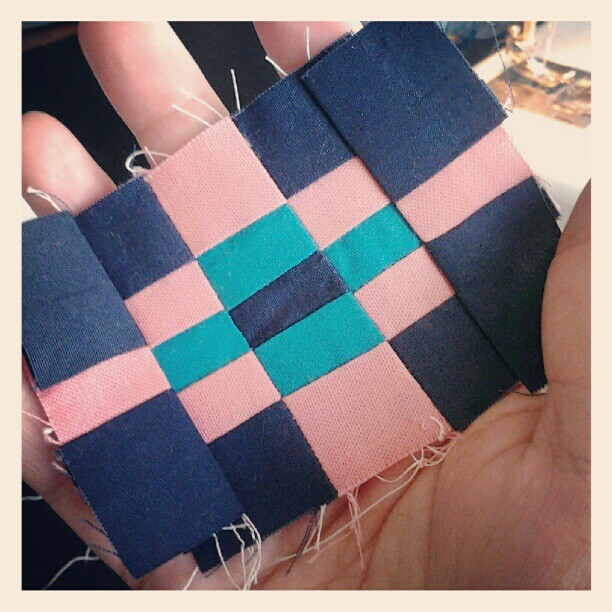 Only doing four blocks for this one and the fabrics are already cut. Pffff, i can knock this out in no time! Number 5. Wow, only on number five and i'm already starting to get tired. It's hopefully going to be a pillow for my shop... and it's also what i've been working on today. More on this further down the line! I've also been doing a bit of work on this one today... i really hope i can finish this one off for this quarter. 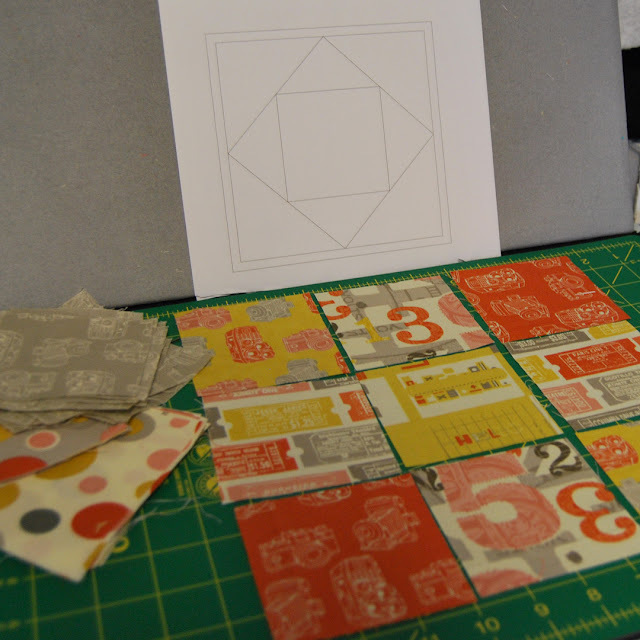 Number seven is the little Sarah Jane Sidewalk Blocks quilt ive been meaning to finish quilting. Number eight... my Christmas Stars quilt. Though, i'm not sure if that's going to happen, i've picked out 14 stars from Carol Doak's 50 fabulous Paper Pieced Stars book and i also have some patterns that i picked up on Craftsy that i want to add. I'm starting to think i'll be lucky if i get this one finished in time for Christmas! Number nine has been giving me grief already and i haven't even cut into the fabric! It's going to be paper pieced and i've been playing around with the pattern for about a month now trying to get it to work the way i want without resorting to y seams. 10, 11, and 12 are all rollovers from Q2 and no new photo's, sorry. 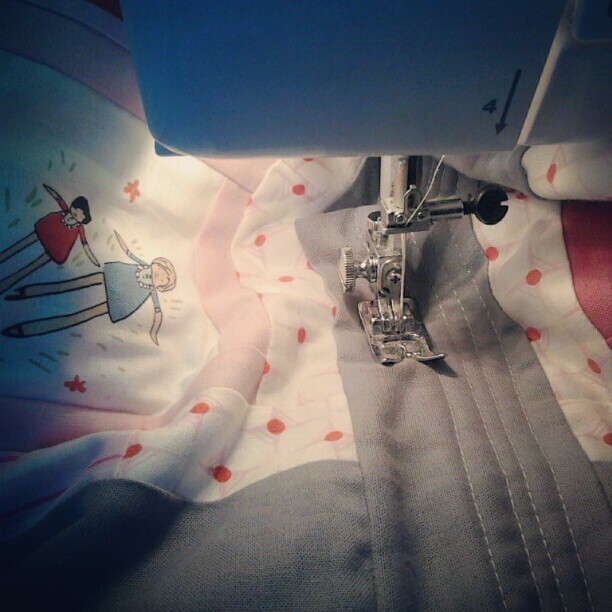 10. my Tula picnic quilt, we've already been on 3 picnics this summer... need to finish this. 11. just finish this one already! 12. i still have no idea how i want to quilt this. Lucky thirteen is the rocket pillow i started for my oldest son Sam. 14. My log cabin triangles from Lady Harvatine's QAL. Number's 15 and 16 are pocket style pillows with pillow pals for my shop. I've gotten as far as cutting the center square for both log cabins and that's it, so here's a pretty shot of the stack of fabrics i'm using. 17 is a pillow for me from this stack of AMH's Field Study. My sweet friend Gina sent me this lovely little stack of charms a few weeks back and i've decided to make myself a Dresden pillow out of them for the couch in my studio! Now, do i need to buy a fancy ruler? Or can i get away with just making a template? I came across a tutorial for getting two petals out of each charm, so that's what i want to do! Any advice or tips, greatly appreciated! 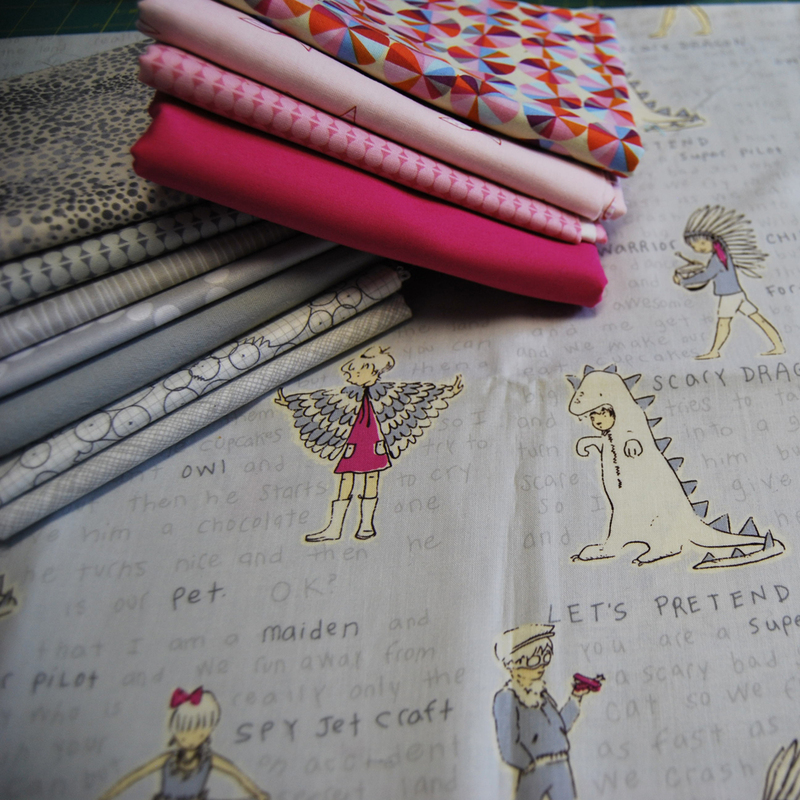 And you should also head over to Gina's blog to see what she's been up to with these gorgeous fabrics, so pretty! This little + quilt, it's been hanging around for at least a year and it would like to be finished. 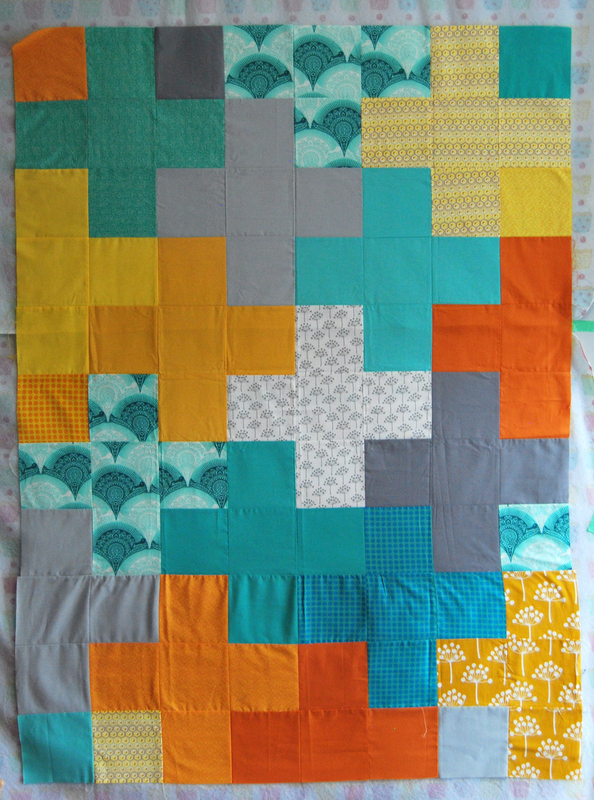 Though i am thinking of taking off the bottom of it... see where it gets wonky three blocks up. 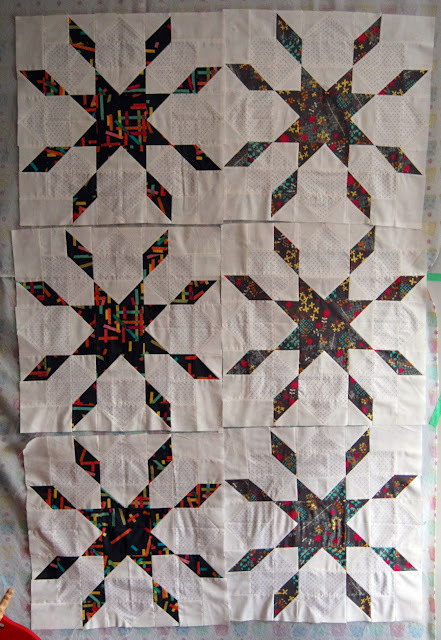 It would still be a nice sized baby/stroller quilt and i already have the backing and binding if i do shorten it. Hmmm. Everyone okay... need to take a quick break? grab a snack? go pee? have laser eye surgery from all the awesomeness? Okey dokey, now on to my WIP's for today! He's a great chap and definitely over worked. I've been trying to add a little bit of colour into the next border for my Indian Summer quilt so i quickly whipped up a little pattern for the midway point of it. So after treating the blisters from my seam ripper i pulled out this little project for some slightly easier paper piecing action! This one went together no problem and is going to make a lovely little pillow if i do say so myself! That's it! I'm off to get some more sewing in before my little guys get home! 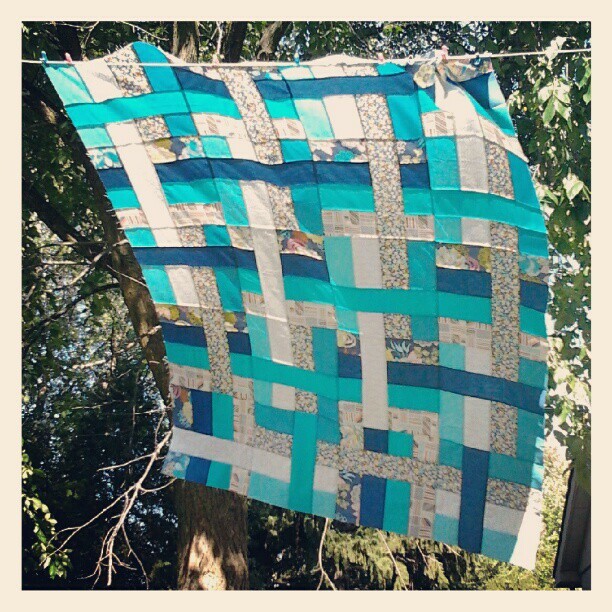 Linking up over at Freshly Pieced for WIP Wednesday as always! And over at She Can Quilt for the Q3 link up... pop over, i'm sure i'm not the only one with a ridiculous list! I love so many of your projects that I don't know where to start so I'll just say good luck! Oh. My. word!!! Girl, you have the projects, so many fun ones!! Washi? Swoon? Love it!! Quilts already cut? Put them in your shop and sell quilt kits...that's one way to finish those WIpS! You are so funny!! Did you make the square in square pattern or get it from somewhere. Making that block has been on my list and I haaaave to now after seeing yours! 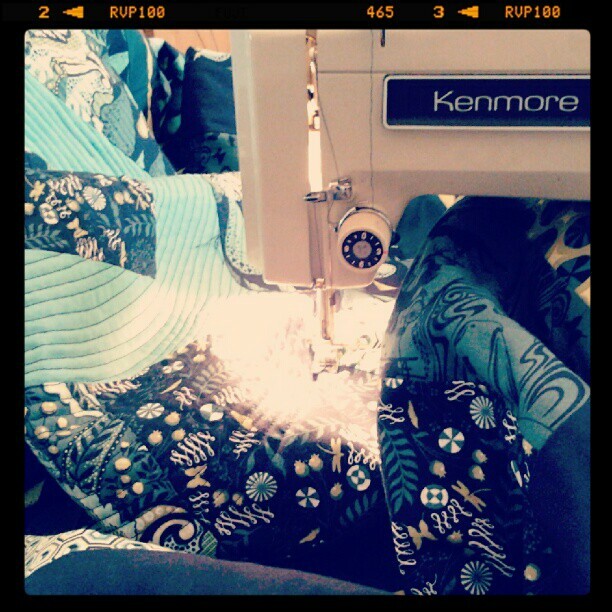 You know I will be following you along on your crazy quilting adventures to see you complete these projects!! Go, Nicole, go! Here's to a productive quarter!! I LOVE the rocket. Washi swoon also. Mental note to self, don't start anything else until Ruby's quilt is finished. I have a large stack of stuff in a box labelled WIP that hasn't been opened for about a year .... maybe longer. girl, you have a LOT of irons in the fire, but it's totally do-able (if you don't add anymore, that is-haha!). They are all awesome though- love that Washi Swoon! wow! where do you keep all these? For once limited space seems like a good thing. It won't let me to have too much going on, lol. 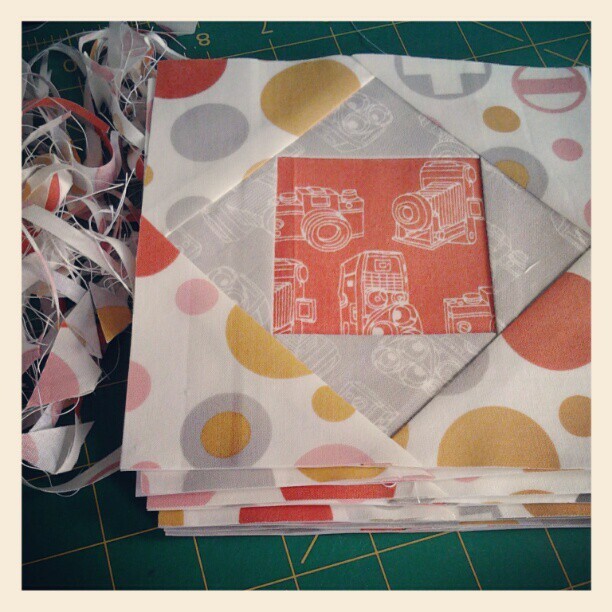 The washi swoon caught my eye and the pilow in progress. All those others are cool but I don't remember them all, lol. Wow. What a list, you go. I'm still stuck on the no A/C. I'm from Texas and can remember not having central air as a child...summer was painful. You weren't kidding about grabbing a drink before reading, haha. So many projects! They are all so great, I don't know how you are going to decide what to work on first. The piece for your Indian Summer border is incredible. I seriously keep staring at it. Good luck tackling your list this quarter, can't wait to see what you get done!